Be the first to share your favorite memory, photo or story of Paulette. This memorial page is dedicated for family, friends and future generations to celebrate the life of their loved one. 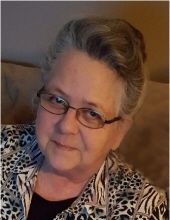 Mrs. Paulette Layne Hedge, age 67, of Olive Hill, Kentucky, passed away Monday, January 21, 2019, at the University of Kentucky Medical Center in Lexington, Kentucky. She was born March 24, 1951, in Carter County, Kentucky, a daughter of the late Bill and Ada Bryant Layne. Paulette was a member of Mt. Top Chapel and she enjoyed going to church and spending time with her family. In addition to her parents, she was preceded in death by one brother, Terry Layne and one sister, Patricia Lou Couch. Paulette is survived by her husband of 50 years, Donnie Hedge; three daughters, Jama Hedge and Sabrina Bailey (Lester), all of Olive Hill, Kentucky, and Donna Riley of Morehead, Kentucky; seven grandchildren, Leannah Bailey, Hailey Miller, Dalton Duncan, Cameron Bailey, Devin Riley, Derek Riley and David Tabor; three great grandchildren, Jaxson Miller, Maverick Miller and Harper Cole; four brothers, Ricky Layne of Tennessee, Timmy Layne and Charles Layne (Jackie), all of Olive Hill, Kentucky, and Billy Layne (Karen) of Mount Sterling, Kentucky; and one sister, Marcella Taylor of Ohio. She also leaves many other family members and friends who will sadly miss her. Funeral services will be held at 11 a.m. Friday, January 25, 2019, at Globe Funeral Chapel in Olive Hill, Kentucky, with Brother Roger Greenhill and Brother Mike Bryant officiating. Burial will follow in the Easterling-DeBord Cemetery in Olive Hill, Kentucky. Friends may visit from 6 p.m. to 8 p.m. Thursday, January 24, 2018, and after 9 a.m. on Friday at Globe Funeral Chapel, 17277 West Highway US 60, Olive Hill, Kentucky 41164. Cameron Bailey, Dalton Duncan, Devin Riley, Derek Riley, David Tabor and Brandon Miller will serve as pallbearers. "Email Address" would like to share the life celebration of Paulette Layne Hedge. Click on the "link" to go to share a favorite memory or leave a condolence message for the family.